EVERY elite puppet US administration is run by the Council on Foreign Relations, the Trilateral Commission and the Bilderberg group. The elitists own the government, founded the privately owned Federal Reserve, they run the biggest corporations and the media. A WHITE House inquiry into the Gulf oil disaster found “no instance” yesterday of BP putting cash before safety. The oil spill commission set up by President Obama said it had “studied the hell out of this”. The report will be embarrassing for Mr Obama who held BP responsible for the disaster, savaging its then chief executive Tony Hayward. Following Mr Hayward’s complaint about the political and media pressure, Mr Obama said: “He wouldn’t be working for me after any of those statements.” The White House vowed to “keep our boot on the throat of BP”. Mr Hayward has since stood down and been replaced by Bob Dudley. At the time critics claimed that Mr Obama, who kept referring to BP as “British Petroleum”, was trying to shift the blame from American firms. The spill which pumped 206 million gallons of oil into the Gulf of Mexico over five months was America’s worst environmental disaster. It was triggered by a blowout on a rig in April which killed 11 workers. But yesterday the oil spill commission’s chief counsel, Fred Bartlit, told the start of a two-day hearing: “We see no instance where a decision-making person or group of people sat there aware of safety risks, aware of costs and opted to give up safety for costs. And in a vindication for BP, which was widely condemned for the catastrophe, Mr Bartlit said the panel agreed with about 90 per cent of the findings of the company’s internal inquiry. This found flaws with American contractor Halliburton’s cement work and the maintenance performed by rig owner Transocean on critical pieces of equipment. The company also questioned how its own employees misread a critical pressure test before the blowout. 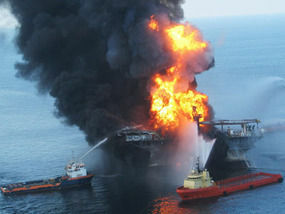 Transocean has denied the criticisms and said BP’s well design was a key factor in the accident. Halliburton has also defended its cement work on the well, and blamed other actions for causing the explosion. But last month Bartlit released a stinging report that said Halliburton used flawed cement in BP’s doomed Macondo well. The Commission’s co-chairman, former Democratic senator Bob Graham, said the panel’s early findings were the “clearest presentation the American people have received to date about what led to this tragedy”. Mr Hayward will tonight give a glimpse into how he dealt with pressures during the crisis when he became one of the most hated men in America and BP faced financial ruin. He tells BBC2’s Money Programme: “If I had a degree at Rada rather than a degree in geology I may have done better.